Jim Korte, dean of students at the University of Illinois Springfield, is the winner of the 12th annual Chancellor's Academic Professional Excellence (CAPE) Award. 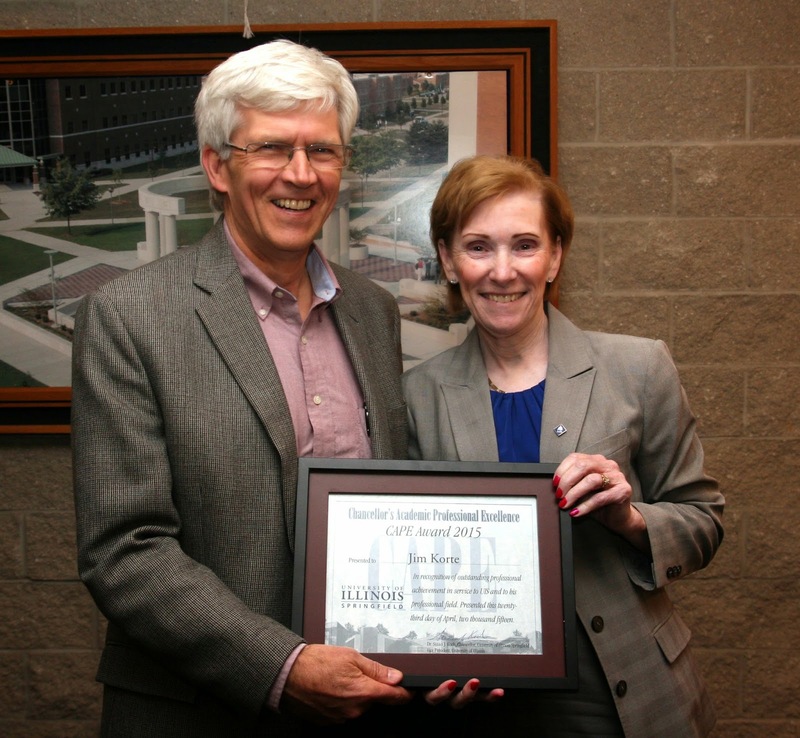 The award was presented by Chancellor Susan J. Koch during a ceremony on April 23, 2015. Korte has worked at UIS for 34 years, starting as director of housing and residential life in 1981, where he helped develop the campus first housing policies and procedures. In 2002, he moved to Student Affairs, and currently serves as dean of students. In that role, he’s responsible for student advocacy and discipline. He also plays an integral role in recruiting, hiring, and training new students affairs staff members. Korte serves on a wide range of campus committees, search committees, and student life committees and serves as a mentor to student leaders. As the dean of students, he often helps students facing difficult situations. “My greatest accomplishments are when I’ve assisted a student in resolving a problem, getting an answer to a difficult question and occasionally knowing that we’ve truly aided them in completing their degree or making a difficult decision,” said Korte. Korte is a member of the Association of Student Judicial Affairs, a Boy Scout leader, and serves on the Board of Directors of the Illinois Educators Credit Union. He earned his bachelor’s degree in psychology from Loyola University Chicago in 1975 and his master’s degree in education in guidance and counseling from Loyola in 1978. Others nominated for the 2015 CAPE Award include Lori Benedict, James Burgdorf, Kimberly Craig, Clarice Ford, Kimberly Gonzalez-Beeson, Janelle Gurnsey, Brian Hodges, Matthew Panich, Kerry Poynter, Matthew Roberts, Donna Schaub, Carly Shank, Van Vieregge and Lisa Whelpley.